This is about how to repair an A35 throttle that has a bad “throttle valve”, in case the original part is not available. Above, the bottom view of the throttle used on all A35 (except A35 Revival) and A55 models from 1992 to early 2008. Everything is black except the light grey “throttle valve”, also known as “sliding block”. It is Tomos part number 223707. Since mid 2008 the controls are different. They say TBS, and the throttle is a wrap-around type, so it has no sliding block. 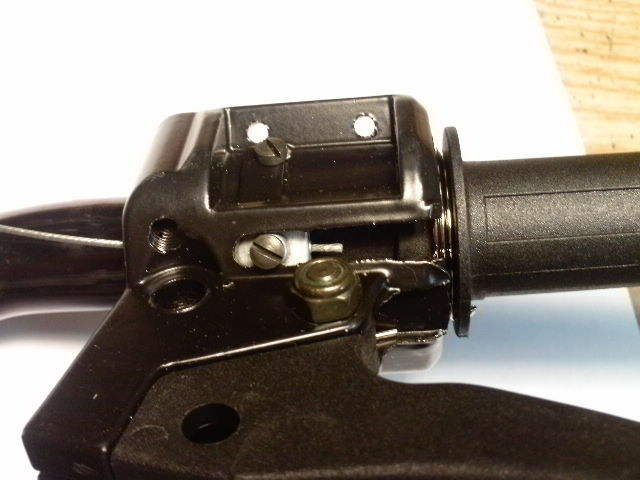 Above, the same throttle with a pinch bolt upgrade. 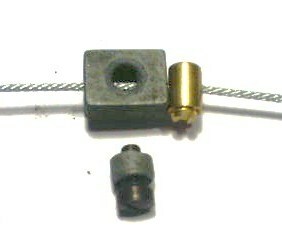 When the sliding block breaks or strips and cannot hold onto the cable wire, a throttle pinch bolt, 5mm diameter by 7mm long is installed on a new throttle wire just behind the broken sliding block. First a new throttle wire is installed and lubed. The old sliding block must be in otherwise good condition, other than it cannot hold onto the wire. A 5mm diameter by 7mm long throttle pinch bolt is slid over the end of the new throttle wire, and positioned against the sliding block. The wire is pulled taut. 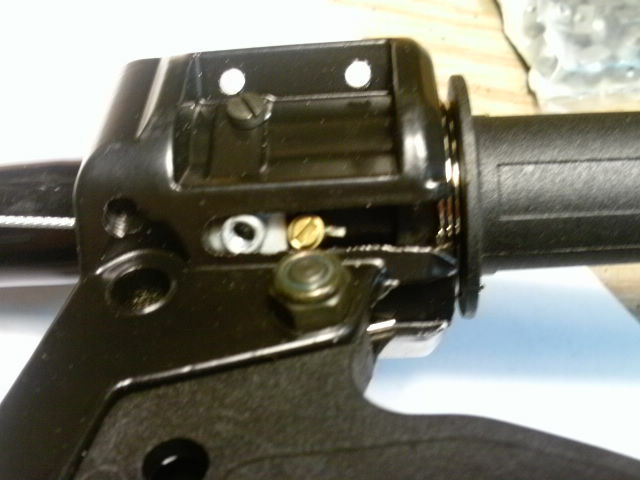 The screw is tightened with a small sharp proper fitting screwdriver, very tight. With the engine not running, the throttle is operated to see if it works and feels right. Then the excess wire is cut off, with a sharp wire cutters (diagonals), when the throttle is held at max, engine off. The short tail should be about 1/4″, like shown above. Bend the tail if it hits the grip at max position. Above left, exploded view. Middle, broken 223707 with pinch bolt back up. Right, pinch bolt 5mm diameter x 7mm. Warning. 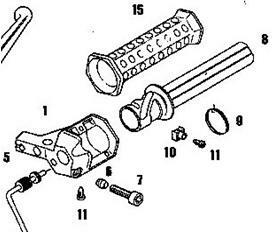 Improper installation or using a bigger or different pinch bolt might make the throttle stick or stay on. Many other things can also make the throttle stick, such as lack of lubrication, or a kinked or frayed cable. See Service/Carburetor for info about sticking throttles. Do not let anyone operate the moped if the throttle is sticking. It should always snap back to idle when you let go. This information is for service personnel and competent home mechanics, not just anyone. Please get help if you need it. Use discretion, and use this info at your own risk. The author assumes no responsibility for the use of this information. You are currently browsing the archives for the Tomos Throttle Upgrade category.